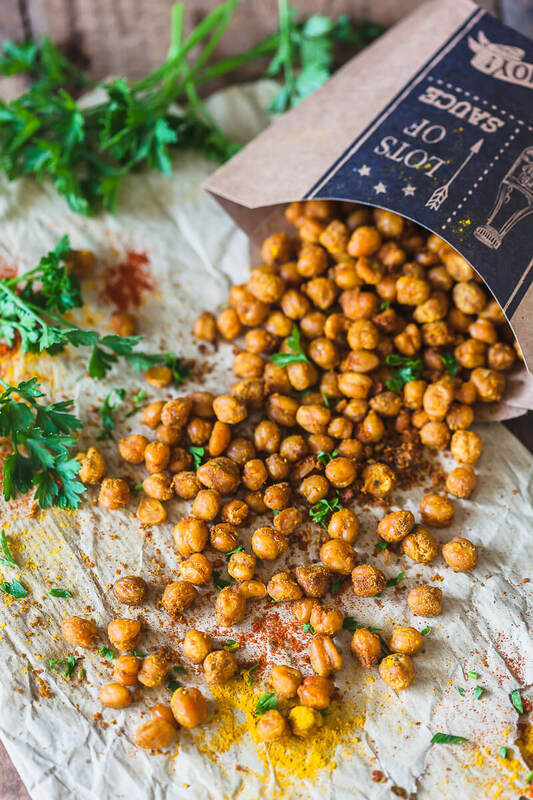 Crispy Turmeric Roasted Chickpeas (Garbanzo Beans) are a great Vegan & Gluten-Free healthy snack or delicious salad topping! Preheat oven to 200°C / 390°F. Drain chickpeas, wash and thoroughly dry. If any skin comes off, you can remove it, but this is optional. Use paper towels to completely dry your chickpeas. In a bowl, pour olive oil, then add your spices: 1 ts red paprika, 1/2 ts turmeric, a pinch of cayenne pepper, a pinch of salt, a pinch of ginger, thyme and oregano. Combine well. Add dried chickpeas to the olive oil coating and toss to combine. Place coated chickpeas on a baking tray, lined with baking paper or aluminium foil and bake for about 30 minutes, or until the chickpeas turn golden-brown. Remove from oven and set aside to cool. During cooling, the chickpeas will turn crispy. Serve as snack, or as topping in soups or salads.